Husband and wife John Dunne and Joan Didion discuss their writing processes, career experiences, and examine what it means to tell the truth. John Dunne begins his lecture by discussing how two people can experience the exact same thing and come away with completely different observations—specifically how writers betray the image the subjects hold of themselves. He gives anecdotes about a shared experience with Richard Rhodes and quotes Henry James, saying, “If a writer talks about writing without quoting from Henry James . 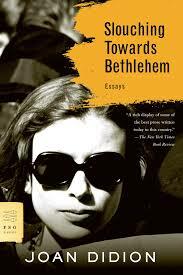 . . then you should get your money back.” Joan Didion then takes the stage to talk about being a journalist and her dislike for the term “literary journalist.” She goes on to discuss the ethics of being a journalist and the questions she asks herself when she writes. Didion emphasizes the importance of revealing one’s opinion as a writer: “This is the tricky part, because most of our press conventions rest on . . . not expressing opinion or bias: in other words, a quite spurious objectivity.” She shares stories from her experiences in the White House pressroom and discusses the challenges of writing about American politics due to the pressure to maintain a conventional narrative. John Gregory Dunne was an American screenwriter, journalist, and novelist. He was born into a wealthy Irish Catholic family in Hartford, Connecticut, and studied at Princeton University. He married Joan Didion in 1964 and they began writing together for the Saturday Evening Post, as well as collaborating on the screenplays “The Panic in Needle Park,” “A Star Is Born,” and “True Confessions,” the latter an adaptation of Dunne’s novel. Dunne was a frequent contributor to The New York Review of Books and his final novel, Nothing Lost, was published shortly after his death in December of 2003. Joan Didion is best known for her novels and essays. She was working as an editor at Vogue when she wrote her first novel, Run, River, and married John Gregory Dunne. Her second novel, Play It As It Lays (1970), was nominated for a National Book Award. More recently, Didion is known for The Year of Magical Thinking (2005), written in response to the death of her husband and her daughter’s illness. It won the National Book Award for nonfiction. Didion’s memoir, Blue Nights, was published by Knopf in 2011.